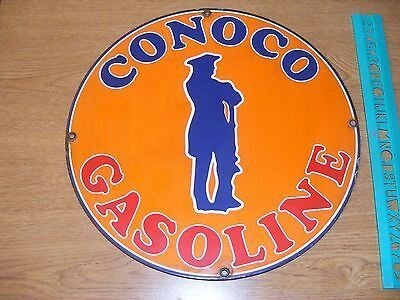 Measuring only 12″ around, this Conoco Gasoline single sided porcelain sign is orange, blue, and red. The sign shows a minuteman standing in the center with a white outline. Above and below him are the text that read “Conoco Gasoline.” The minuteman is holding a gun in his left hand with his other arm propped up on it.